This last weekend we stopped by the Pacific Rim Bonsai Collection to view an exhibit of several of our teachers trees. It is always very exciting to see them displayed in new and different setting. The trees of course were all wearing their very best and looking especially glamorous. One of the trees on display was the tree I worked on in the previous post “Wire Wire Every Where” . I was so pleased to see how the tree finally looked in its new clothes that I was very surprised and delighted to have it pop out at me as I turned the corner of the display. I remember it being very much a moment of realizing that all the time and work put into that fantastic winter silhouette had finally payed off and there was that beautiful ancient tree I had imagined. Below is a shot of the tree on display. The honor of having Daniel choose to display the tree is overwhelming and gratifying. 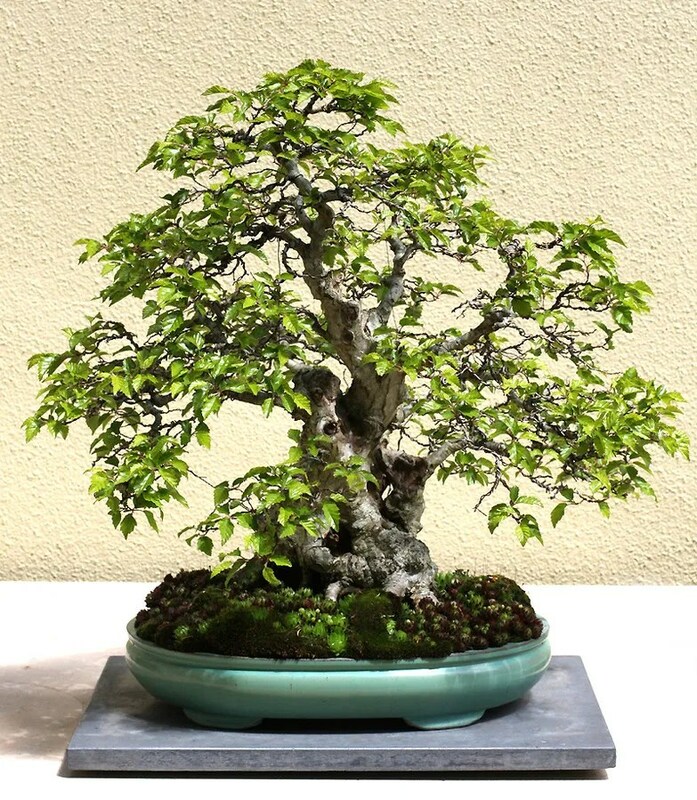 This entry was posted in Bonsai, Design, Display, Progression and tagged ancient, bonsai, bonsai display, bonsai styling, focal point bonsai, gnarly, hornbeam, ramification, wiring by ang3lfir3. Bookmark the permalink. Looks great! It actually looks like a grumpy old tree! Well done. I like that Randy “grumpy old tree” …. thanks!! Amazing tree! Your branch work really shines and I appreciate the lack of a dense canopy. Just wonderful. Thank you very much crust … like you I really like open sprawling canopies on these ancient looking trees. thanks! I am very glad you like it! !